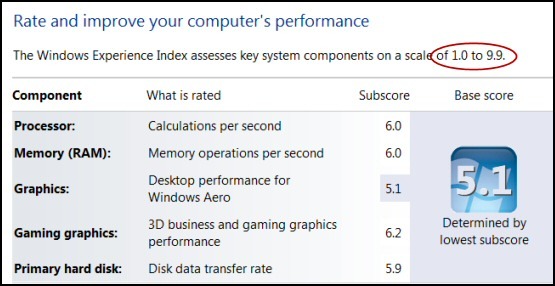 The Windows Experience Index gives you two useful pieces of information about a computer: a quick performance rating, and a drill-down so that you spot the machine's weakest link, which is often 'Graphics'. It always seems hard to find the Windows Experience Index score. The secret is to go to the Control Panel, System and Security, then SYSTEM. The next trick is to reveal the sub-scores; to do this just click on the 'Windows Experience Index' link, see screenshot above right; it will reveal the subscores in the screenshot below. I like having this instant 'Grading' of my computer's potential. It's also helpful to have a standardized number to compare the capabilities of different Windows 8 machines. This WEI number can be useful for convincing users there is no need to upgrade a machine just to run a new computer game, this is especially true if the software has a recommended WEI rating. Remember that the key difference with Windows 8's WEI is that Microsoft have extended the measurement scale has to 9.9; the maximum in Windows 7 was 7.9. Here above you can see the 5 components that make up the WEI. What trips up beginners is that the final score is not an average, but the lowest of the subscores. Indeed, this highlights the purpose of WEI, to identify the performance bottleneck, and to check if the computer is suitable for a particular task. For example, basic computer tasks such as email and internet browsing only require a value of 2.5; it's only if are getting into graphic intensive programs that you need a value of at least 5. On a freshly installed Windows 8 computer the base WEI score will be unrated. Visit the Control Panel, System and 'Rate this computer'. If you may have manually, or automatically, updated your graphics card's driver, then the Windows 8 WEI will realize that its value is out of date and will prompt you to run the test again. Once clue is that the base score changes from a blue background to a grey. Another clue is that you see 'New hardware detected'. Primary hard disk: Disk data transfer rate. The overall maximum for each subscore has risen from to 9.9 in Windows 8. There has been a steady extension of the range from 5.9 in Vista, and 7.0 in Windows 7. Microsoft say the increasing the range enables the rating to take into account advances in computer hardware. However, that does not mean that if you upgrade the operating system, then Windows 8 will have a higher rating than Windows 7; on the contrary, I found that my rating dropped from 5.2 to 4.9, even though I had not made any hardware changes. What can you to improve your Windows experience rating? Update drivers – I love cost nothing solutions. Buy, or swap the graphics card. Overclocking the CPU. I am not a great fan of this technique. Run the built-in Microsoft troubleshooter to get more ideas on what could be slowing down your operating system. 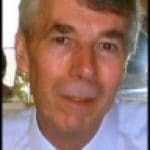 It is possible to edit the XML files and thus artificially increase the rating of your computer. I choose the word 'artificially' carefully because I gave up after a quick try. I began wondering 'what am I doing here', why do I REALLY want to fake my results? If you want to try this, then the file you edit has the word RECENT, and not initial, in its filename. Mine was called: DWM.Assessment (Recent).WinSAT.xml. I right-clicked and opened the file with WordPad. Next I called for the built-in find and searched for SystemScore, and increased its value to 8.3. Once I had saved the file, I clicked the refresh button in Control Panel, System, whereupon my faked score appeared. To let you into a secret, the editing once went horribly wrong, nothing was displayed opposite 'Rating' in the Control Panel. I got out of jail by moving all the files out of the DataStore into a backup location. Then when I returned to the 'System' menu I could now see: 'System rating is not available'. The good news was that the link led me to: 'Rate this computer'. Fortunately, there was a happy ending when my genuine ratings reappeared. 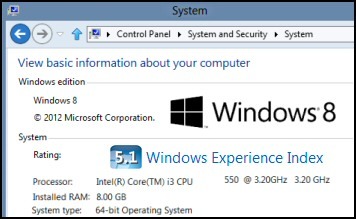 The Windows 8 Experience Index measures your computer's ability to run the operating system. The base, and particularly the subscores, are useful for deciding whether a computer game will work, or if your system needs an upgrade to perform the tasks you are planning for this computer.